A Ravelry question on the possibility of executing a particular fabric on the machine has led to the experiments in this post. The pattern that led to the discussion is free hand knit one, shared and published on the Purl SOHO website and on Ravelry. 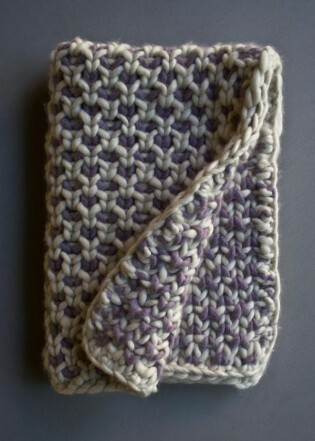 The gauge for their project is 4.75 stitches = 4 inches in stitch pattern, it includes garter rows. 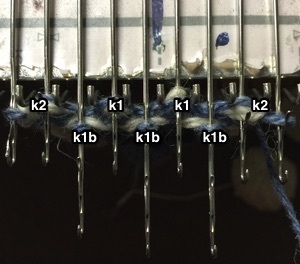 Such rows may be executable on home knitting machines by transferring from ribber (Passap front bed) to main bed, alternating with reversing the process at predetermined frequency, depending on stitch type. 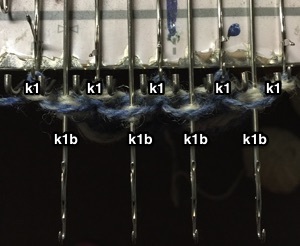 K1b is the hand knit equivalent of tuck for that stitch on that row, adding to the mix. Not practical for G carriage use, as the latter does not form tuck loops, and hand retooling would be required for all k1b stitches. Using holding to create tuck stitches in non auto patterning days was commonly used, and I chose to do so here. As machine knitters we are conditioned to believe that single color rows are impractical to execute, and that the yarn would need to be cut on each side after the one row. Color changers are on one side or the other, making striping with frequent color changes practical if executed in even multiples of rows. Transfer carriages are available that will help move stitches from one bed to the other, I personally have never had the patience to work with them enough to get good at using them without dropping stitches, so I went back to even lower tech than usual, using the garter bar on the bulky, and beginning pattern row 1 with COR. 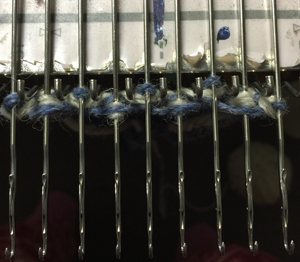 Before attempting nearly every row turns, it is helpful to have some practice with turning work over using garter bar, develop a sequence to repetitive actions, keeping careful notes as to what works for you, and using contrasting yarns in tests to better understand stitch structure. 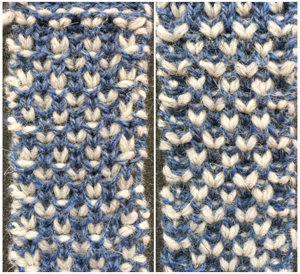 In my sample the white yarn was thicker than the blue, reversing colors or balancing yarn thickness would change the visual look of the fabric. Beginning on small samples helps work out issues and the making of the decision to try on a larger project or simply as a border. 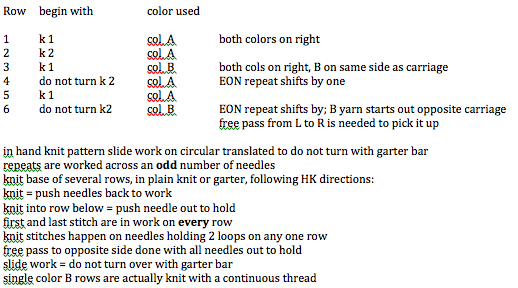 Previous Previous post: Cellular automata charts for knitting, etc.